Just like that, we already finished the first month of summer vacation and few weeks from now the school year will start again. Last Thursday was Ethan’s last day in swimming lesson and first day of summer class so we’re still in busy mode. Honestly, I’m not yet ready for June. I’m still lazy to go to back to school hopefully sipagin ako because I need to pay tuition, buy books and uniform. Anyway, last month I received a lot of cream of mushroom so I cooked beef with mushroom and just recently carbonara. One of my favorite pasta is carbonara but my husband and son prefer tomato based pasta. 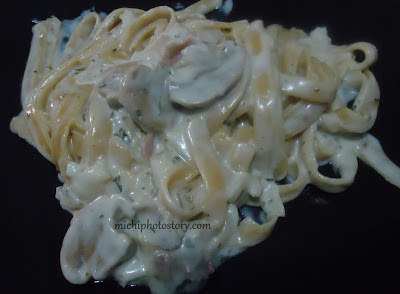 My son called it “red spaghetti” and whenever I cooked cream based pasta he will always say “Ayaw niyan, red spaghetti please”. But they have no choice because I want to use the cream of mushroom. 2. Cook bacon and sauté garlic and onion. I used the fat from the bacon so no more butter or oil. 4. Add cream of mushroom and all-purpose cream. Stir. 5 .Add cheese and dried parsley. 7. Toss the pasta and serve.